Here is one of my favorite lunches in the summertime. I can remember a big bowl of this in the fridge growing up. It gets even better the longer it sits. I’ve been known to spoon this over a mound of cottage cheese, which might sound weird, but I like it. The sweet and tangy dressing is so good! 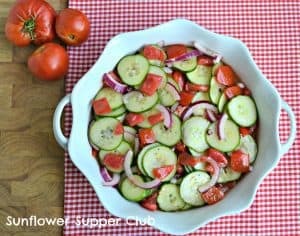 In a medium bowl place the cucumber, tomatoes and onion. In a small jar with a lid, place the oil, red wine vinegar, sugar, kosher salt, black pepper, and garlic powder. Shake until well combined and the sugar is dissolved. Pour over the cucumber mixture and stir gently to coat. This looks delicious. Thanks for sharing on Foodie Friends Friday. 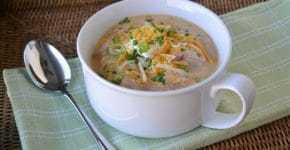 Thank you for sharing this delicious recipe on Foodie Friends Friday! Don’t forget to come back and VOTE tomorrow! I’m also sharing this on Facebook this morning! Come over to Walking on Sunshine to see the comments! Can’t wait to try this, it looks really good!